Heraeus Photovoltaics, a provider of technology and service solutions for the renewable energy industry, announces that it has signed a strategic cooperation agreement with Solar Space. Under the agreement, the two parties will carry out comprehensive cooperation in regular processes, dual printing and other new technologies and solutions to optimize metallization paste performance and application, as well as production process improvements in the solar cell production of Solar Space and Zhonghui Photovoltaics. 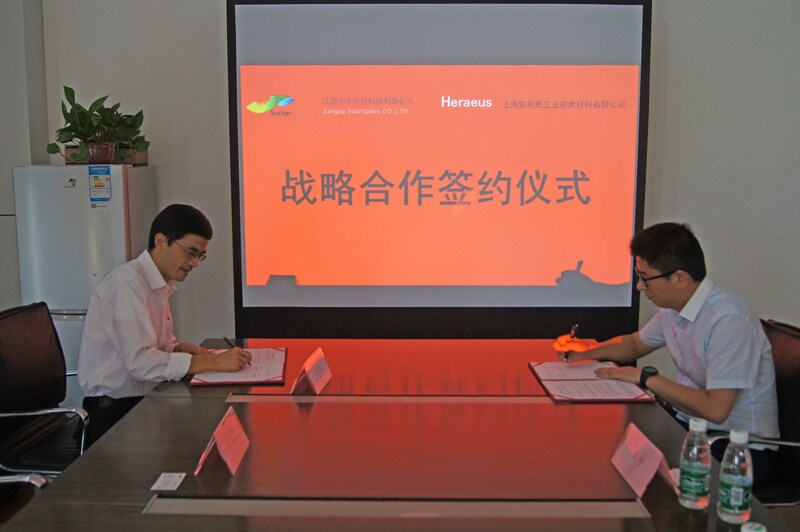 Liu Guyan, general manager of Solar Space, said, “Based on the remarkable advantages of Heraeus Photovoltaics’ SOL9641BX in single process, we will be able to improve our competitiveness with more powerful support from Heraeus in our dual printing and the other processes that are planned for the future. Together with Heraeus expertise, we also expect further breakthroughs in performance through optimization of the SOL9642BX product and production processes.” Liu expressed that the exchange and cooperation with Heraeus regarding technologies, development and other cores would be enhanced by Solar Space’s planning for four phases’ development. Since the early period of production, Solar Space has had faith in Heraeus’ powerful technological prowess and development competence, and witnessed its products from all series, from the 9411 to the current 9641BX. The sound cooperation over the years and the solid foundation of trust resulted in this comprehensive cooperation. The two parties will closely collaborate and solve problems with sincerity and openness in order to make new breakthroughs to improve the conversion efficiency of crystalline silicon photovoltaic cells.